Watching your diet can do a lot more than keep you in a bikini this summer — it can also help keep your skin gorgeous and photo ready. We asked the experts about the worst foods for our skin, and some of them may surprise you. Below are seven foods you should absolutely limit if you’re trying to keep your skin looking clear and glowing! 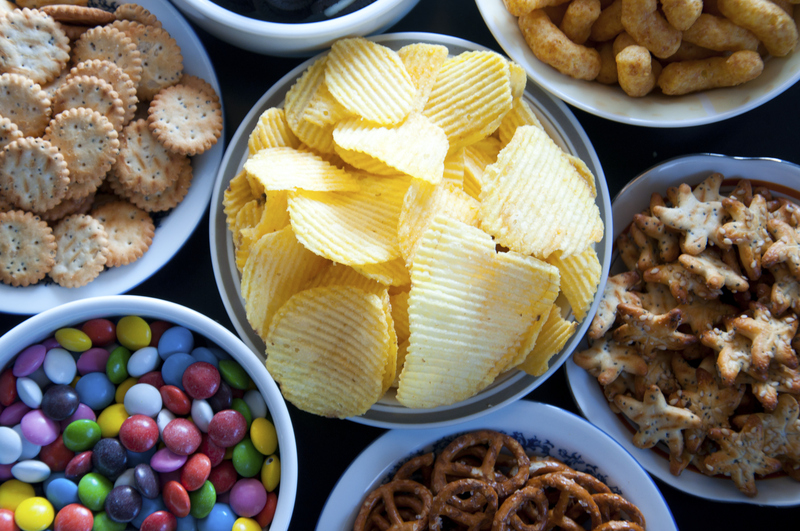 Highly processed junk foods made with additives and preservatives such as white bread, chips, french fries, soda, and candy spike your blood sugar levels. This causes your hormones to stimulate excessive oil production, clogging pores and aging the skin, says Carina Sohaili, founder of Vibrant Healthy Life and a Board Certified Celebrity Nutrition and Health Counselor. Diets high in processed ingredients (especially sugar) have been shown to contribute to crow’s feet, wrinkles, and fine lines because it damages the tissue that is responsible for keeping the skin smooth. When you develop cystic breakouts (those hard, painful, underground blemishes that linger for weeks) on the chin, jaw line and neck area it might be a sign that you’re getting more dairy in your diet than your body can tolerate, says celebrity esthetician Renee Rouleau. Your skin acts as an excretory system to get rid of things that your body is not in agreement with, so when you get too much dairy (and since dairy is naturally harder to digest) it comes out in the form of cystic blemishes in the lower area of the face. If you have problematic skin (i.e., acne) acne loves sugar. “When there is an imbalance (out of control yeast presence), redness and inflammation will continue and be constant factors if sugar isn’t removed from the diet,” says Becky Sturm, CEO/Founder of StormSister Spatique. This is the hardest ingredient to remove from the diet as most of us are addicted and when you begin to look at every food label, you’ll be surprised by how many products sugar is in. Caffeinated drinks cause dehydration and will deplete your skin of its vital nutrients. When skin is dehydrated and dry, it’s natural elasticity and collagen is effected, causing it to become more prone to sagging and wrinkles, says Christina Kauffman, owner and founder of Blush, New England’s Largest Organic Sunless Tanning studio. This doesn’t mean you can’t treat yourself — just make sure to drink the recommended eight glasses of water daily to keep your body and skin hydrated. A diet without live foods — foods like salads, including those containing magnesium which is a natural detoxifier, etc. — can cause a lack of luster in the skin and hair. Salads, raw juicing, and raw foods do the opposite by giving your skin a natural glow. It’s difficult to get enough magnesium through foods because of modern food processing methods and because the mineral has been depleted from soils, so supplementation with an absorbable form, such as magnesium citrate powder that can be mixed with water, can help both skin and overall health, says Carolyn Dean, MD, ND, a doctor and nutrition expert, author of The Complete Natural Guide to Women’s Health. These may be great snacks, but not so great for your skin. Peanuts are rich in oils, which should be avoided by persons with oily skin as it can lead to breakouts, says Gina Mari of Gina Mari Skincare.